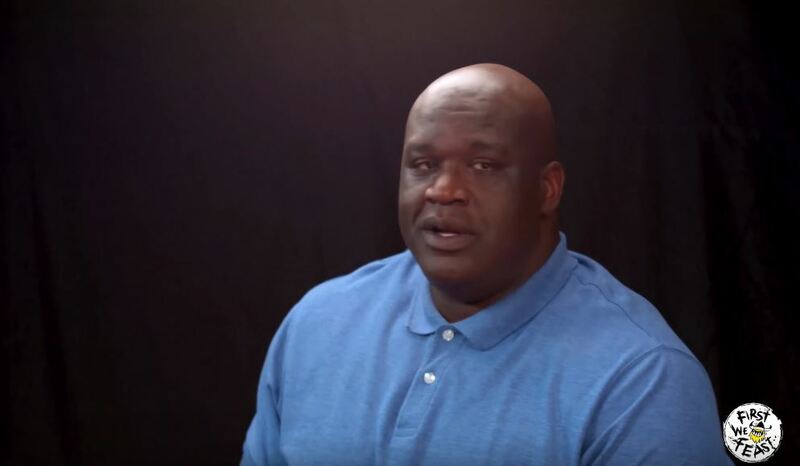 Shaquille O'Neal once famously took the "One-Chip Challenge," and said he wouldn't "make a face." But boy did he make a face, though he had a chance to redeem himself during First We Feast's famed Hot One's challenge. On the show, The Big Diesel promised again to not make a face, and well, he was wrong again. 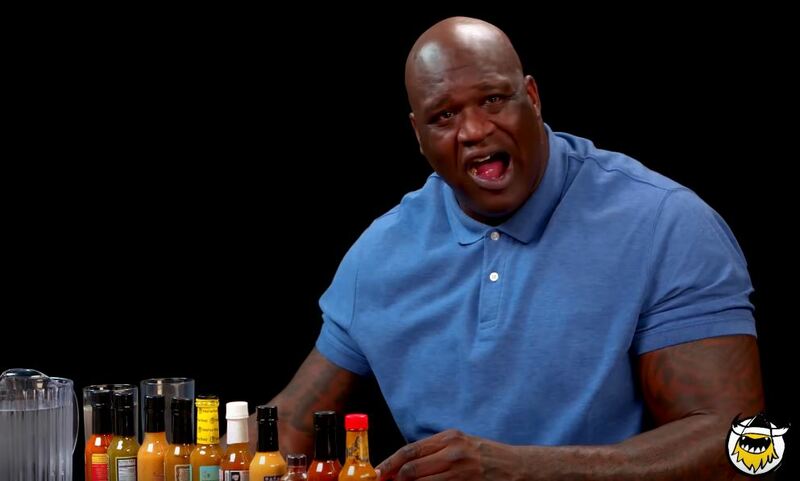 Absolutely there were plenty of faces, and we're picking out the best ones as Shaq battled through 10(ish) of the hottest wings in the world. 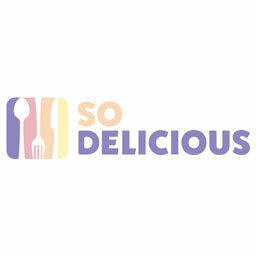 Kind of. 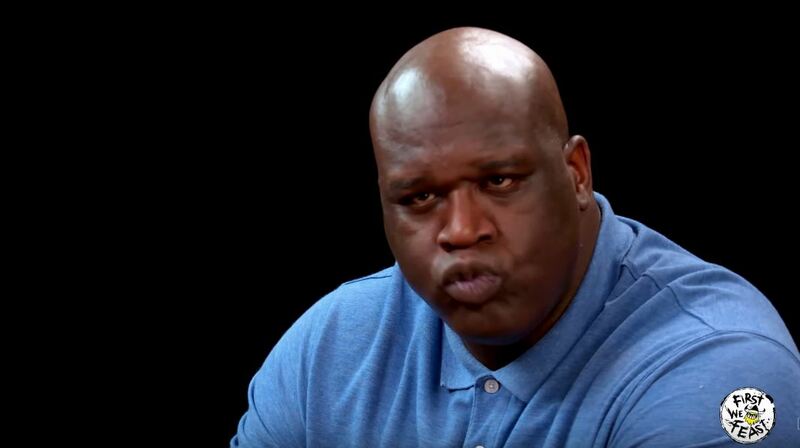 Shaq didn't take long to pull out classic Shaq expressions. After biting the very first wing, he looked straight into the camera and , well, the picture above happened. 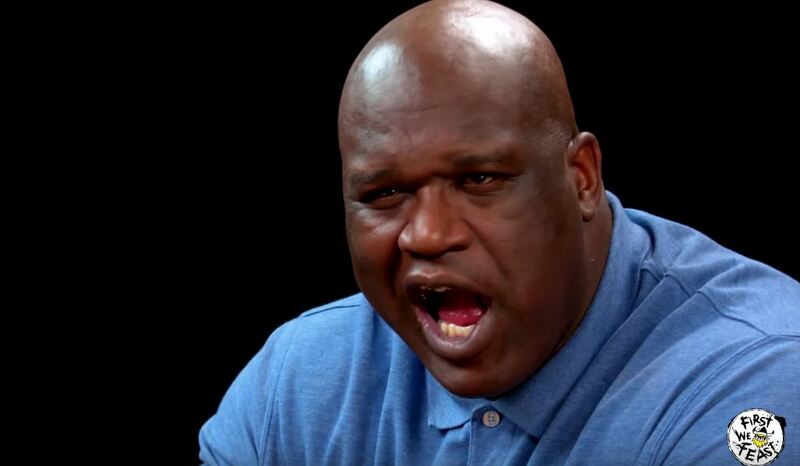 Shaq handled the Kobe Bryant question pretty well. It was well documented that they didn't always see eye-to-eye, yet he breezed through the inquiry and tried jumping head first into the next wing, which he wasn't really ready for. 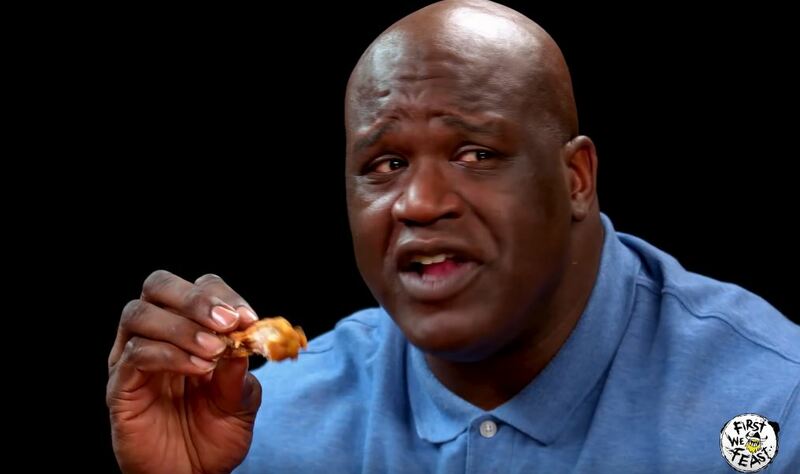 You can tell Shaq was really struggling by the third wing, to the point that he started biting straight into the wing's bone. He tried to blame that look of anguish on the bone, but we all know he had a fiery inferno in his mouth, courtesy of Paddy O's Potion hot sauce. 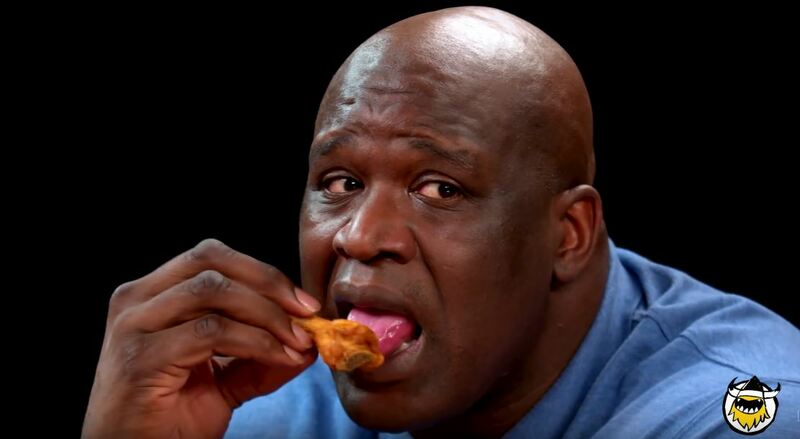 By wing four, Shaq finally admitted that he was feeling it, even though it was very apparent that the other wings also gave him some trouble. Unfortunately, he was not even half way through the challenge. You know you're in trouble when you can't even lick the wing without fear. 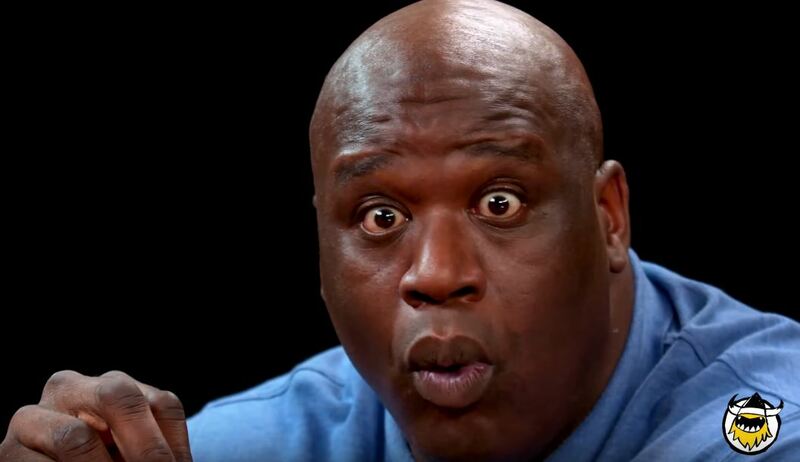 It was at this exact moment that Shaq realized he f***ed up. 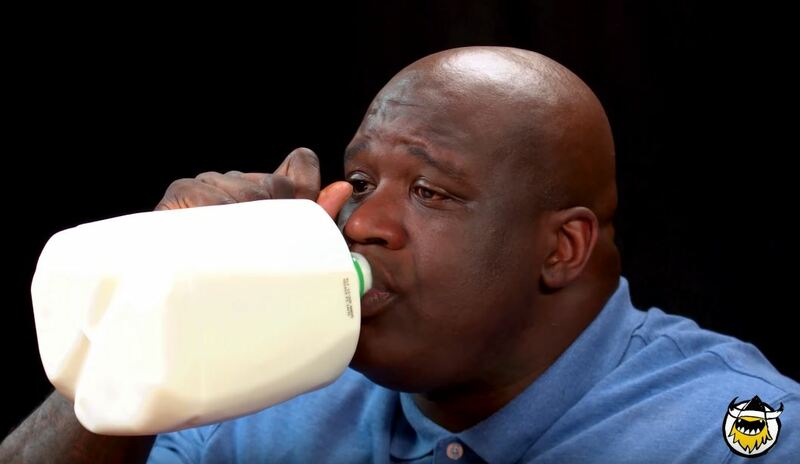 Shaq came ready with a whole damn gallon of milk. Surely it helped, but he really needs a whole new tongue if he wants to undo the spiciness he just encountered from Da' Bomb. How did this even make the final cut? Shaq decided to inappropriately thrust his pain away. Shaq finished strong, until host Sean Evans challenged him to a free throw contest with a Fisher Price court. Surely, Shaq had some free throw flashbacks. To be fair, he used to make them when they mattered most. Be sure to watch the full episode, it's so worth it. And thank you to Shaq for all these great moments.